Amateur sleuth Hannah Swensen is part owner of a bakery. 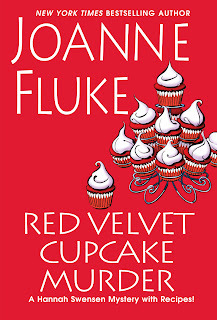 Whether it's consoling a (living) victim, trying reassure her two boyfriends, or creating an alluring day at the shop so that local sources of information find themselves hovering over the desserts and leaking a few clues, Swensen is sure to stir up some yummy recipes while sampling the murder mystery laid into her life. Unlike many of the cozy-with-recipes books, though, this one doesn't group the baking directions at the rear of the book -- they are cleverly interspersed in the text, and even foreshadowed! From the Easy Fruit Pie to the Raspberry Bar Cookies to a killer guacamole, there's a lot to drool over. And that doesn't even count the condos Hannah Swensen is eyeing with envy, when sudden death interrupts her catered party. 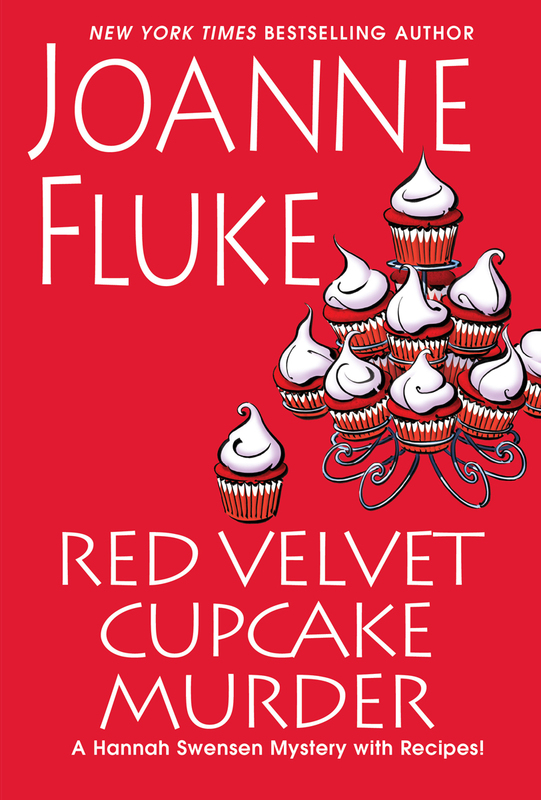 Even her coveted Red Velvet Cupcakes aren't an unmixed blessing -- in fact, they may be drawing more suspicion to her, something she could have avoided if she ever walked away from a crisis -- but that's just not Hannah! Tuck this one in the beach bag this summer; just make sure you have reservations for supper after your day at the beach, because your tastebuds will only accept a certain degree of teasing before they insist on satisfaction ... something in common with this sweetly tangled murder plot, which Hannah needs to resolve before people she cares about are thrust into danger. PS -- Cook's note -- If you're more into organic veggies, breads baked from scratch, and even gluten-free recipes, skip this one and wait for Edith Maxwell's locavore mystery, A Tine to Live, A Tine to Die (end of May release; review soon-ish). Fluke's recipes are more dependent on mixes and other staples of the 1960s kitchen -- yummy though they can be! I picked up this book for the same reason that I picked up the first in the Twilight series -- because a YA expert (librarian this time; bookseller last time) said she'd loved it and so did the teens (AND their mothers, said one of them!). 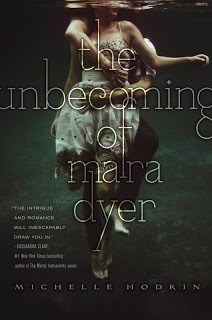 The funny coincidence is, there turns out to be something paranormal involved in THE UNBECOMING OF MARA DYER, which is normally something I'd avoid. But with my earlier experience, I dipped into Twilight before I quite realized how much it depends on vampires, and the plot kept me reading anyway. With Hodkin's book, though, it was the character of Mara Dyer that compelled me to stick with it after I realized the creepy aspect. Dyer's doubts about what she's experiencing make the creepiness much deeper. And the powerful resonance of Mara's version of courage and her stubborn refusal to give in to bullying drew me into the story. I've found very few books this year that struck me as so accurate about human nature and the emotions of newly forming independence -- not to mention that first uncertain taste of the perils of sexuality. Mara Dyer wakes up in a hospital bed with no idea why she's there -- and when her parents yield to her frantic insistence and tell her all three of the friends with her on an adventure three nights ago are dead, her waking nightmare has just begun. A swift move to Florida, the agonies of a new school, an adorable boy who persists in courting her (not a great idea when he's ruined a lot of reputations already), and the threat that she's losing her mind: Mara's coping skills are only human, so how can she endure so much? And what will collapse first? Is it Mara's own self? No, this doesn't have the long-term resonance of the Harry Potter series; on the other hand, it has way more depth than Twilight (no offense, Twilight can be good beach reading, but it's not going to pull me into re-reading that first volume, reading the others, or reviewing them). But it's a true mystery, with layers of revelation, agonized searching for the truth, and a dogged insistence on facing reality, no matter how strange that reality may become. Many thanks to the Maine librarian (nameless in the blog post) who wrote this list last fall -- I've consumed four of the titles this week, and will draw on the experience further, I'm sure. But this above all: It's character that makes a book unforgettable. Michelle Hodkin knows how to craft character. I'm hoping (fingers crossed) that she can pull it off in all three books. I'll let you know later. Controversy is not new for the novels of Jodi Picoult, a northern New England author whose medical/legal thrillers often target current moral quandaries. Her 2013 book, THE STORYTELLER, takes her onto Nazi/Holocaust territory, where history is in constant flux and opinions flare hot. 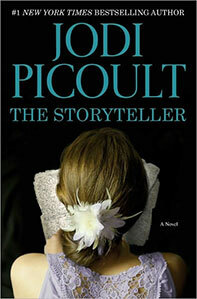 Today The Tablet provides an intriguing view of the issues for this book: http://www.tabletmag.com/jewish-arts-and-culture/books/130344/jodi-picoult-holocaust-vampires -- well worth reading. Although the snow and ice outside the window dare me to say "April" again, it really is still National Poetry Month -- and a cluster of stubborn daffodil stems are protesting the weather. It's great to keep hearing and reading good poetry all month ... Every month, of course, should be poetry month (and is better when poetry is added). One of our favorite poets, especially for his powerful performances, is Martín Espada. Most of his upcoming readings -- schedule HERE -- are in upstate New York and New England. 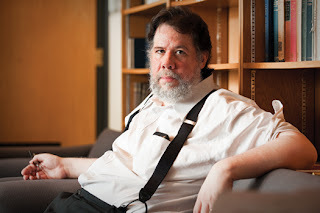 If you can't be there, check out this interview with him on Moyers and Company. 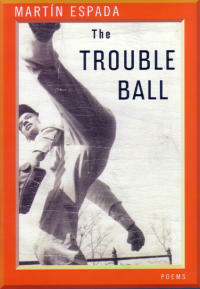 FYI, his newest collection is THE TROUBLE BALL. More on the book, HERE. Next post ... back to mysteries. Although, come to think of it, one of the best mysteries is the way a good poem can slice apart the cloudy sky over the soul. 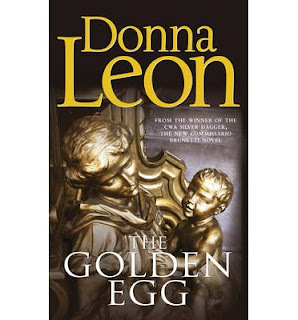 Donna Leon's 2013 crime novel THE GOLDEN EGG features Commissario Guido Brunetti and takes us again to the canals and back streets of Venice -- a multilayered city whose layout is so complicated that even this life resident and seasoned police detective reaches again and again for his copy of the guidebook Calli, Campielli e Canali. Dark, damp doorways at the water side of structures echo for the Commissario the complicated families around him, some with pedigrees nearly as long at the city's. THE GOLDEN EGG is far from a standard crime novel, however. Leon opens at the Brunetti home, where one of the most endearing of crime fiction couples, Guido and his wife Paola, are enjoying an evening meal and conversation with their two teenaged children. The family plays a word game in the conversation: One offers and ending, the next provides a sentence or two that preceded the end of a story, and so on, back to someone proposing the first sentence of the "story written in air." The game quickly becomes a metaphor for detective work, as Guido receives a phone call at work from his distressed wife. Paola's abrupt question to him -- "You know the boy who doesn't talk? At the dry cleaner's?" -- is a lead-in to letting her husband know the "boy" is dead. Actually it's a young man who's died, and the assumption has been that he is deaf, and perhaps also "dumb," not just in the sense of unable to speak, but also in terms of mental capacity. Yet both Guido and Paola find the abrupt and probably suicidal (surely not criminal) ending to this nameless young man's life tragic, and both feel guilty that in all the years they've used the cleaning service where the "boy" has done simple tasks, they never asked his name. Guido, mired at work in a highly political assignment for his reliably self-centered boss, begins to probe the death. Seasoned mystery readers will expect murder to emerge from Guido's investigations. Be assured that Donna Leon's skilled and evocative tale does involve crime -- but you'll have to wait for it with Guido, as he pushes backward through the story of the young man he'd barely noticed before death. I love the research access that the Internet provides. At the time when Dave and I found an elegant copy of James Salter's book FORGOTTEN KINGS: THE DAYS OF IRWIN SHAW, we were already experts in mysteries and gaining rapidly in poetry -- but literary reflections like this one were not our passion (and still we don't often "go there"). 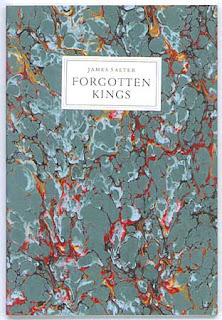 We purchased the book and added it to our Kingdom Books shelves for the sake of its physical beauty. It's a gem, and was created at the noted Stinehour Press to be issued by the Bookman Press. This morning, however, I noticed a review by John Freeman in the Boston Globe, of Salter's newest novel, All That Is. So before reading the book, I pulled out our Salter item and enjoyed it again, then skipped through several archived pieces on Salter, found on the 'Net. I was particularly intrigued to discover that he'd been born Horowitz, in New Jersey, and had a strong military career before the success of his first novel took him away from the U.S. Air Force. Then, at last, I settled into Freeman's review of the new Salter novel, and found it a mix of thumbs up and down, but always rich: There's Freeman's own evocative writing (he begins the review with "Desire is one of memory's most potent accelerants"), and a comment on Salter's writing that intrigued me: "No one in American letters moves a story along through dialogue as naturally as he does," Freeman comments. "One moment we're in Bowman's head, the next in his lover's, and at the start of new chapters we're briefly in the mind of someone entirely new." That's a skill that I want to witness and explore, so I'll be watching for a Salter novel as we begin our spring purchasing binge (it is such fun to be married to Dave, as we share enjoyment of acquisition, reading, reviewing -- each in our way -- and introducing readers to more good books). And I hope that FORGOTTEN KINGS soon reaches the shelf of the person who is passionate about literary reflections, and who's developing a Salter collection to enjoy. We're planning a 9 pm Wednesday date with "BBC America" television, for the start of a mini-series based on Alan Furst's pre-war novel, THE SPIES OF WARSAW. 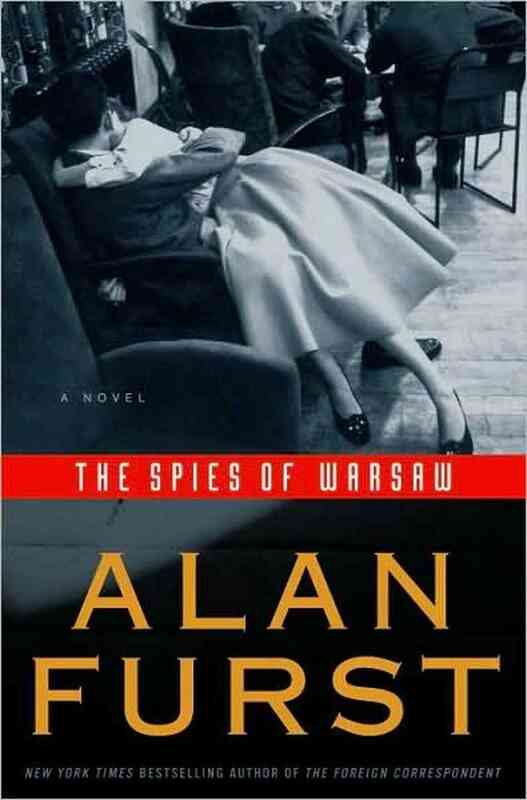 Dave and I are both committed fans of Furst's writing, enjoying the way these espionage novels evoke the 1930s and the looming Nazi machinations with depth and all senses -- as well as a touch of love or lust. Here's one review on the TV series. And click here for a list of what Kingdom Books has on the shelf right now from Alan Furst, including some signed copies. Clea Simon's companion feline is named Musetta -- and there's a photo on Simon's blog of this canny cat, staring into the computer screen. Whether Musetta can guide Simon in plotting, who knows? But the years of companionship show up wonderfully in Simon's newest mystery, PARROTS PROVE DEADLY. Cat mysteries have a long and honorable tradition, with the most recognizable being the series by Lilian Jackson Braun: the "Cat Who" books center around the life of former newspaper reporter James Qwilleran, and his two Siamese cats KoKo and Yum-Yum. But Braun's series was relatively light-hearted, and Simon's is ... well, you've got the message about "pet noir," right? And "deadly"? There are dangers and risks for animal behaviorist Pru Marlowe, and most of them come from the owners, not their pets. More than dark and deadly, the Marlowe mysteries wrestle with what humans believe about other species, and why they could be dead wrong. For instance, the African grey parrot that's causing an emergency call from the local senior complex keeps repeating a frightening sequence of sounds. Is it a replay of the death of the parrot's "person," aging and infirm Polly Larkin? An accident being voiced over and over, due to the bird's own trauma? Or could there be a hint from the parrot that murder took place right in front of the bird? Pru Marlowe isn't sure -- and that's one of the most enjoyable aspects of this hard-working and determined sleuth: Pru questions just about everything. She has to. Her very bright cat Wallis turns out to be able to "speak" to Pru through a sort of interspecies telepathy, and Wallis has scornfully made it clear to Pru that all creatures do something of the same. But not as well as Wallis can! A lot of cats are fluffy-minded, dogs are obsessed by their noses announce, the ferret that Pru sometimes consults is more bite than bright, and don't start on what squirrels and pigeons have in mind. If she's not going to consider herself crazy, then Pru's got to pay close attention to grasp this strange world of messages around her. He lifted his leg and then with a sigh that carried a wave of resignation, he plowed ahead toward his inhospitable home. "Women." That I got, loud and clear. "Don't see what's right in front of them." "What, Growler?" I stopped, and since I held the other end of the leash, he had to, as well. He turned and eyed me, his button eyes cold. "The guide dog -- the one you call 'Buster'?" he broke his silence. "She's more concerned with her person than with anyone else -- and with good reason. People die there. She smells it, and I can smell it on her." I nodded, grateful for that damp black nose. ... It was an old folks' home, no matter what anyone called it. Death's waiting room. Did he -- or did Buster -- mean there were suspicious deaths? Deaths that shouldn't have happened -- what the coroner would cal misadventure? Or even murder? "Watch what happens to that bird," Growler said, barking once as we came up to his door. "Nobody likes a blabbermouth." Nobody likes a snoop, either, but that's what Pru becomes, unable to let the circumstances rest until she knows the truth. In Simon's quick-paced narrative, there's plenty of suspense and a very real sense of struggle to translate what's important in the "speech" of companion animals into something Pru can make sense of. I enjoyed the first two of Simon's pet noir series, Cat's Can't Shoot and Dogs Don't Lie; this one is at least as good, and a great diversion from the gritty urban thrillers I've also been considering this month. 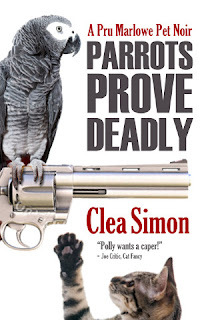 You don't need to have read the others in order to enjoy PARROTS PROVE DEADLY, although they build nicely in terms of Pru's discovery of her ability to receive animal voices and the stresses and fractures in her life. Great series -- thanks, Clea Simon, for this third title! PS -- Okay, if you've read your mystery classics, you already see the coincidence of Pru's surname in a book of noir: Marlowe, right? Now, can you place Wallis? Hint: Don't let the spelling trap you. And think about a noted Boston writer, one who shared the Bay State with Clea Simon until his passing, just a couple of years back. Come on, you can do it!